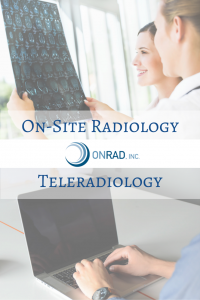 10 Benefits of an On-Site Radiologist - ONRAD, Inc.
Onsite radiologists are essentially the “CEO” of their departments, which means they need to be able to manage staff, engage patients and work with stakeholders to constantly build the organization’s brand. Onrad “CEO Radiologists” are able to recognize issues within a department and learn to take actions to resolve them. This is due in large part to the guidance and support provided by Onrad. Our current clients tell us there are many benefits to working with Onrad, Inc, especially in instances where we have one of our radiologists onsite. Other than getting top notch, sub-specialized radiologists with strong clinical expertise; having an Onrad physician at your hospital or practice can bring about a number of benefits that might not have occurred to you. Thinking an onsite radiologist could benefit your practice or hospital department? Reach out to us and we can help you determine what the best solution is for you.